While our mothers would never likely confuse us as being ‘geniuses,’ we may very well be witnessing a genius cluster at work dedicated to serving veterans and their families in select communities across America today. Fifteen years into a long war, the all-volunteer force is stretched at a time when budgets to arm, much less care for, our troops are contracting. Bold, creative leadership is busy upending the status quo, for today, smart folks are starting to emerge, to coalesce if you will, from within a select cadre of progressively minded communities, around the identity and future state of how we care for America’s veterans, transitioning service members, and their families. Ms. Noonan writes that it was a genius cluster, after all “that invented America.” She goes further to suggest such a clustering—FDR, Churchill, and deGaulle –also saved it. For the genius clusters to emerge they require deep crises – “Historic figures need historic circumstances,” writes Noonan. While complex undertakings such as building a democracy, winning wars, and keeping the peace have all involved historic, in fact, genius personas, before they were the figures global history now recognizes, it was a set of complex, historic circumstances that drew them each to act, to serve. To a lesser, but no less important extent, we must change the way we address the complex and multifaceted needs of our nation’s service members, veterans, and their families. If we are to remain a nation that retains its all-volunteer armed forces, our approach for welcoming these assets back into our communities requires immediate and collective action. As the preferred approach for solving complex social problems, Collective Impact initiatives are starting to address issues such as simplifying human services delivery systems, educating America’s youth, reducing recidivism, and transforming health care. Its basic tenets involve creating a common agenda, shared measurement amongst the collective, mutually beneficial and reinforcing activities, continuous communication between its members of the collective and importantly, establishing a backbone organization to champion the initiative. Collective Impact has even made its way to the veterans’ health and human services sector in a growing number of partner communities. One such community is Charlotte, North Carolina, where we find a renaissance of sorts underway within the veterans’ health and human services sector that has at its very beginning, something of a genius cluster at work addressing “…bigness, with steady hands and steady eyes….” the needs of the community’s military-connected members and their families. “All genius, like all politics, is local,” writes Eric Weiner in his new book, the Geography of Genius. In Charlotte, locally, their efforts have grown into a coordinated effort called NCServes, and similar efforts are taking hold in other cities across the country within the AmericaServes portfolio. Smart leaders from Pittsburgh to Raleigh, New York City to Charleston, and Seattle are collectively being recognized for introducing disruptive innovation within the veteran services sector and proving once again, the impact that genius clusters can have on the trajectory of human history. NYServes, PAServes, SCServes, and WAServes all stand as testament that it takes more than a village. It takes genius. It takes a community. It also takes a catalyst. 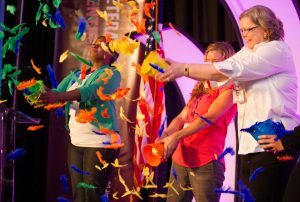 Recognizing “bigness,” as the opportunity within “Driving Community Impact,” IVMF began cultivating select communities – not just every community – but only those where the conditions for pursuing meaningful collective impact initiatives themselves would be welcome. In Charlotte, NC, we found the required leadership, supportive philanthropic partners, and health and human services providers willing to innovate beyond themselves, to generate collective impact and best serve its military connected members and their families. This point is key. For collective impact to take root, the community must gain and maintain the trust and confidence across the community itself, something often overlooked by many. By introducing evidence-based approaches found within public health research, AmericaServes is designed to accelerate the actual transformation of service delivery in the veterans’ services sector – and eventually, across all human services. But as good as the best collective impact models might be, without a shared technology solution to actually connect all the community partners and track outcomes for the veterans, they are control towers, with neither radar screens nor radios. Appropriate then that the connective technology solution would come from a pilot. When Unite Us founder and CEO, Dan Brillman, wasn’t flying weekend missions with the 514th Air Mobility Wing in the Reserves, he struggled to help his fellow airmen navigate the transition to the civilian sector. Unite US, and its suite of care coordination software tools, data analytics and dashboards was born of the need to fill in gaps by bridging communities, many of which have been in search of such technology in the first place. The final component required to achieve the mass critical to smartly deliver a solution to multiple communities throughout the United States was generously provided by leaders in the philanthropic space, including the Walmart and Schultz Family Foundations. In 2014, IVMF with its AmericaServes partners, approached North Carolina and a local, respected veteran-centric nonprofit, Charlotte Bridge Home (CBH). Over the next 12 months, IVMF, CBH, and a group of dedicated health and human service providers such as Mecklenburg County Veterans Services, Johnson C. Smith University, and Goodwill Industries of the Southern Piedmont explored how to work together, beyond collaboration, to introduce scalable change to the veterans’ services sector within the Charlotte community. The idea, the genius, if you will, was to work on the Charlotte community’s terms and leverage its resources to drive the systemic change sought. In 2015, the combined efforts began driving a stake in the status quo of service delivery approaches that have miserably, and for years, failed to meet the needs of our returning veterans and their families. The collective now formed represented a new force, a combination of local understanding paired with tools and models of service delivery that promised to change the trajectory of service delivery in their community, but which could be applied to other communities simultaneously in a scalable national framework. To visualize the mechanics of the system past and present, consider an aviation analogy where service providers, from the Urban Ministry Center, to Cardinal Innovations Healthcare, the USO of North Carolina, and even the state and federal VA in many ways, are like old fashioned regional airports with binoculars and chalk boards, all isolated to some degree, all doing their best to take care of passengers (veterans) as they arrive, but with little visibility of the plane (groups of veterans) until the moment it arrives. Visibility is even poorer when it departs. A ‘quarterback,’ or Coordination Center, like the Charlotte Bridge Home, takes the roll of air traffic controller, on a regional scale, tying together all the feeder systems. Visibility is greater than just the aircraft. With the right technology solution, a network can track the actual passengers and ensure that everyone is getting on and off where and when they need to in accordance with peaking needs. This is not a new concept, but it is new in its application to veterans. Collaborative interplays of systems and technology have provided unprecedented levels of accountability and transparency (think mobile device check-ins enabled by GPS). Genius clusters have revolutionized the aviation industry, mass transit system and private healthcare, but maybe the most famous exemplar of disruptive collaboration is Federal Express. The idea that you could give your precious package to a stranger, and yet have complete trust and confidence that you could find it at any time AND that it would make it to the place that it needed to be. Such a genius clustering of technology and management need not be the last time that a massive federal bureaucracy was disrupted. One year in, North Carolina’s supporting market-based approach, NCServes, has helped transform the means by which this community now serves its transitioning service members, veterans and their families. Owning a simple allegiance to ‘meeting veterans and their families where they are,’ NCServes’ coordinated network of services, resources, and care has reached 300 percent more veterans, service members, and their families in its first year than Charlotte Bridge Home has reached at any other point in its service delivery history. Recognizing as well that each individual reached through NCServes’ efforts is actually presenting with more than one need, the network has delivered a 500 percent increase in closed casework across the assembled provider base working within the NCServes coordinated network, a tremendous testament to primarily the community’s hard-working providers, but also to the great work being done by Charlotte Bridge Home’s NCServes Coordination Center staff as well. Numbers will never adequately tell the whole story here; there’s much more going on behind the scenes than anyone realizes. The true value of the work involved with coordinating access to the community’s array of services lies within the new-found value proposition: by working together across a common technology platform, providers now know not only what their work ‘looks like’ (workflow spread across 52 interconnected providers), they also now know definitively what the impact of that collective activity and effort is achieving (outcomes). An informed community is now a community that understands supply – full-spectrum service delivery – and demand – the needs of its military-connected members and their families – in real-time and uses that information to improve upon service delivery methods and techniques equally in real-time. Welcome to the future, it’s here. So where do we go next? What lies ahead for this community of smart folks pushing so hard to infuse performance-oriented effort on behalf of those who served and their families? We teach and train others how to do the same. As a community committed to serving the needs of the nation’s transitioning service members, veterans and their families at the highest levels, Charlotte, North Carolina, now recognizes it bears a responsibility to teach and train other communities across the country to elevate their efforts. In old-school, train-the-trainer fashion, this particular community has shifted its focus a bit to be more than just one community doing things well; it now has set its sights on ensuring other progressively minded communities are interacting not only on service provision, but on interconnected learning – and there are other like-minded communities as well. This approach – this Community of Practice – will evolve organically under the leadership of these innovative communities and work to build-out not only the actual innovation occurring, but the learnings that come with; to reduce mistakes, ramp-up time, increase provider adoption, and influence policy across communities. Teaching and training others always involves a sophistication and selfless, servant leadership model that is oriented on “doing good” for our communities. Importantly, communities themselves – like Charlotte – are now demonstrating that “doing good” means working smart collectively. Always good to work with smart folks; who knows, maybe even our mothers would be happy. Jim McDonough and Ilario Pantano lead IVMF’s AmericaServes initiatives and can be reached by email at jdmcdono@syr.edu and igpantan@syr.edu.